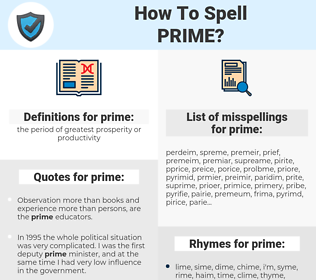 What are the misspellings for prime? 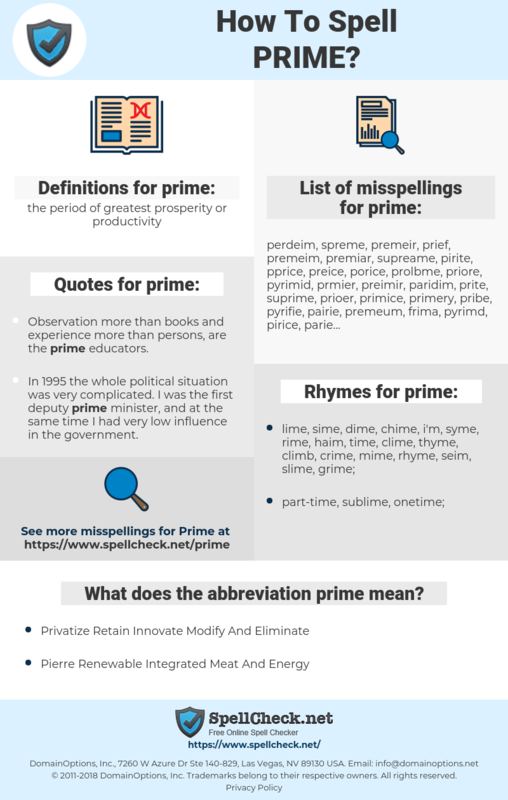 What are the common mistypes for prime? What is the definition of prime? What does the abbreviation prime mean? What are the quotes for prime? What are the rhymes for prime? What are the translations for prime? What are the common typos for prime? Prime as a boy's name is a variant of Primo (Italian), and the meaning of Prime is "first". This graph shows how "prime" have occurred between 1800 and 2008 in a corpus of English books. I'm 42 now, what I would consider prime time. Of course the playing is important but writing and the establishing of what you are going for is prime too. belangrijk, eerste, uitstekend, voortreffelijk, primair, eersteklas. principal, parfait, de premier ordre, préférentiel, majeur, amorcer, apprêter, primaire, fondamentale, central, prioritaire. wesentlich, vorbereiten, prima, erstklassig, original, vital, ideal, oberste, fundamental, Primzahl, grundieren, betriebsfertig machen, Determinante, Auge, Prime, Prim, ansaugen lassen, schussbereit machen, primordial, Premier. naczelny, najlepszy, zasadniczy, pierwszy, pierwszorzędny, pierwsza. perfeito, aurora, primário, primeira, preferencial, prioritário, juventude, marcantes, centrais, apogeu, decisiva, primordiais, destacada, primos, preferenciais, prioritária, invejável, cimeiro. armar, mayor, privilegiado, excelente, apogeo, preparar, esencial, flagrante, grandes, primera, primo, perfecto, cebar, primaria, preferente, consumado, imprimar, paradigmático.